This article is concerned with Bertha Pappenheim as the patient Anna O. For her life before and after her treatment, see Bertha Pappenheim. Anna O. was treated by Breuer for severe cough, paralysis of the extremities on the right side of her body, and disturbances of vision, hearing, and speech, as well as hallucination and loss of consciousness. She was diagnosed with hysteria. Freud implies that her illness was a result of the resentment felt over her father's real and physical illness that later led to his death. According to one perspective, "examination of the neurological details suggests that Anna suffered from complex partial seizures exacerbated by drug dependence." In this view, her illness was not, as Freud suggested, psychological, but neurological. Professor of psychology Hans Eysenck and medical historian Elizabeth M. Thornton argued that it was caused by tuberculous meningitis. While some believe that Freud misdiagnosed her, and she in fact suffered from temporal lobe epilepsy, and many of her symptoms, including imagined smells, are common symptoms of types of epilepsy, others meticulously refute these claims. Language disorders (aphasia): on some occasions she could not speak at all, sometimes she spoke only English, or only French, or Italian. She could however always understand German. The periods of aphasia could last for days, and sometimes varied with the time of day. Neuralgia: she suffered from facial pain which was treated with morphine and chloral and led to addiction. The pain was so severe that surgical severance of the trigeminus nerve was considered. Paralysis (paresis): signs of paralysis and numbness occurred in her limbs, primarily on only one side. Although she was right-handed, she had to learn to write with her left hand because of this condition. Visual impairments: she had temporary motor disturbances in her eyes. She perceived objects as being greatly enlarged and she squinted. Mood swings: Over long periods she had daily swings between conditions of anxiety and depression, followed by relaxed states. Amnesia: when she was in one of these states she could not remember events or any of her own actions which took place when she was in the other state. Eating disorders: in crisis situations she refused to eat. During one hot summer she rejected liquids for weeks and lived only on fruit. Pseudocyesis: she underwent symptoms of a false pregnancy. When in analysis with Freud, she accused Breuer of impregnating her, which however was merely imagined. At first the family did not react to these symptoms, but in November 1880 a friend of the family, the physician Josef Breuer, began to treat her. He encouraged her, sometimes under light hypnosis, to narrate stories, which led to partial improvement of the clinical picture, although her overall condition continued to deteriorate. Starting on 11 December Bertha Pappenheim was bedridden for several months. Bertha Pappenheim's father died on 5 April 1881. As a result, she became fully rigid and did not eat for days. Her symptoms continued to get worse and on 7 June she was admitted against her will to the Inzersdorf sanatorium, where she remained until November. After returning she continued to be treated by Breuer. She returned to this sanatorium several times over the course of the following years (sometimes at her own wish). 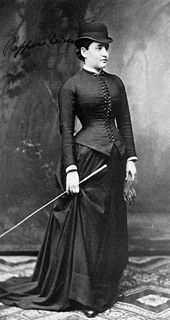 According to Breuer, the slow and laborious progress of her "remembering work" in which she recalled individual symptoms after they had occurred, thus "dissolving" them, came to a conclusion on 7 June 1882 after she had reconstructed the first night of hallucinations in Ischl. "She has fully recovered since that time" were the words with which Breuer concluded his case report. On 12 July 1882, Breuer referred Pappenheim to the private Bellevue Clinic in Kreuzlingen on Lake Constance, which was headed by Robert Binswanger. After treatment in Bellevue she was no longer personally treated by Breuer. While in Kreuzlingen she visited her cousins Fritz Homburger and Anna Ettlinger in Karlsruhe. The latter was one of the founders of the Karlsruhe High School for Girls (Mädchengymnasium), which was attended by the young Rahel Straus. Ettlinger engaged in literary work. In an article which appeared in 1870 entitled "A Discussion of Women’s Rights" (Ein Gespräch über die Frauenfrage) she demanded equal education rights for women. She also gave private lessons, and organized "ladies’ literature courses". Pappenheim read aloud to her some of the stories she had written, and her cousin, 14 years her senior, encouraged her to continue her literary activities. During this visit toward the end of 1882 Pappenheim also participated in a training course for nurses which was offered by the Women's Association of Baden (Badischer Frauenverein). The purpose of this training was to qualify young ladies to head nursing institutions. She could not finish the course before her visit came to an end. On 29 October 1882 her condition improved and she was released from treatment in Kreuzlingen. In the following years, about which little is known, she lived a quiet life with her mother in Vienna. There is evidence of three stays at Inzersdorf during this time; her sickness was not conquered. Despite her illness, Pappenheim was a strong personality. Breuer describes her as a woman "of considerable intelligence, astonishingly astute reasoning and sharp-sighted intuition [...]”. Pappenheim became known to the general public under the pseudonym of Miss "Anna O. ", a patient of Breuer. Her case history was described in Studies on Hysteria (Studien über Hysterie) (1895), which Breuer published together with Freud. She is presented as the first case in which it was possible to "thoroughly investigate" hysteria and cause its symptoms to disappear. Her statement that being able to verbalize her problem helped her to unburden herself is in accordance with the treatment later denoted in psychoanalysis as the "catharsis theory". Accordingly, Freud described her as the "actual founder of the psychoanalytic approach". Based on this case study the assertion that "those with hysteria suffer for the most part from their reminiscences", in other words from traumatic memories which can be "processed" by relating them, was formulated for the first time. Breuer’s findings are still today the foundation of psychoanalytic therapy. The statement that symptoms disappear with awareness of their unconscious preconditions has been confirmed by all subsequent research […]. Freud specified psychoanalytic "therapy," but not theory. Psychoanalysis did not come into being until "Interpretation of Dreams" was written five years later. Aspects of the Anna O. case were first published by Freud and Breuer in 1893 as preliminary communications in two Viennese medical journals. The detailed case history appeared in 1895 in Studies on Hysteria. The name Anna O. was constructed by shifting her initials "B.P." one letter back in the alphabet to "A.O." When the first volume of Ernest Jones’ Freud biography appeared in 1953, in which the Anna O. of the studies was identified as being Bertha Pappenheim, her friends and admirers were outraged; they only knew her from her time in Frankfurt. One of the reasons for Dora Edinger's biography was to contrast her identification as being "mentally ill", which at the time was considered defamatory, with a depiction of Pappenheim as a philanthropist and advocate of women's rights. Jones' portrayal contained further details, especially legends about the conclusion of Breuer's treatment, but except for the information contained in the studies nothing was known about the further course of her illness. New facts only became known based on research by Henri Ellenberger and subsequently by Albrecht Hirschmüller, who were able to find Breuer's case history of Pappenheim and other documents in the archives of the Bellevue Clinic in Kreuzlingen. Those of Freud's letters to his fianceé Martha Bernays which have been published contain a few hints about the course of Pappenheim's therapy and Freud's relationship to Breuer, but until all of Freud's letters are published there is room for speculation. Breuer began the therapy without a clear method or theoretical basis. The treatment of her symptoms ranged from feeding her when she rejected food to dosages of chloral when she was agitated. She had two completely separate states of consciousness which alternated quite often and suddenly, and in the course of her illness became more and more distinct. In the one state she was sad and apprehensive, but relatively normal. In the other state she had hallucinations and "misbehaved", that is, she swore, threw pillows at people, […] etc. He noted that when in one condition she could not remember events or situations that had occurred in the other condition. He concluded, "it is difficult to avoid saying that she dissolved into two personalities, one of which was psychically normal and the other mentally ill."
Such symptoms are associated with the clinical picture of what, at the time of her treatment, was referred to as "split personality" and today is referred to as "dissociative identity disorder." The existence and frequency of such an illness was, and still is, controversial. A first therapy approach was suggested by the observation that the patient calmed down and her speech disorder improved whenever she was asked to tell stories that had presumably arisen from her daydreams. About these daydreams Breuer remarked: "Although everyone thought she was present, she was living in a fantasy, but as she was always present when addressed, nobody suspected it." He also encouraged her to calmly "reel off" these stories by using such prompts as a first sentence. The formula he used was always the same: "There was a boy…" At times Pappenheim could only express herself in English, but usually understood the German spoken around her. About her descriptions Breuer said, "The stories, always sad, were sometimes quite nice, similar to Andersen’s 'Picture Book Without Pictures'". The patient was aware of the relief that "rattling off" brought her, and she described the process using the terms "chimney-sweeping" and "talking cure". The latter formulation subsequently became part of psychoanalytic terminology. Stories from a "private theater"
Breuer developed systematic remembering and "reeling off" the occasions when hysterical symptoms first occurred into a therapeutic method first applied to Pappenheim. To his surprise he noticed that a symptom disappeared after the first occurrence was remembered, or after the cause was "excavated". Breuer described his final methodology as follows: In the morning he asked Pappenheim under light hypnosis about the occasions and circumstances under which a particular symptom occurred. When he saw her in the evening, these episodes—there were sometimes over 100—were systematically "reeled off" by Pappenheim in reverse temporal order. When she got to the first occurrence and thus to the "cause", the symptoms appeared in an intensified form and then disappeared "forever". In this way all the hysteria came to an end. The patient herself had made a firm resolution to finish the business on the anniversary of her transfer to the countryside. For that reason she pursued the "talking cure" with great energy and animation. On the final day she reproduced the anxiety hallucination which was the root of all her illness and in which she could only think and pray in English, helped along by rearranging the room to resemble her father's sickroom. Immediately thereafter she spoke German and was then free of all the innumerable individual disorders which she had formerly shown. I was in a position to guess what really happened with Br’s patient long after we parted company when I recalled a communication from Br dating from the time before our joint work and relating to another context, and which he never repeated. That evening, after all her symptoms were overcome, he was again called to her, and found her confused and writhing with abdominal cramps. When asked what was the matter she responded, "Now the child I have from Dr. Br. is coming". At that moment he had in his hand the key which would open the way to the Mothers, but he dropped it. With all his intellectual talents he was devoid of anything Faustian. He took flight in conventional horror and passed on the patient to a colleague. She struggled for months in a sanatorium to regain her health./ I was so sure of my reconsruction that I published it somewhere. Br’s younger daughter (who was born shortly after the conclusion of that therapy, which is not irrelevant as to a meaningful connection) read my portrayal and asked her father about it (this was shortly before his death). He confirmed my analysis, which she later relayed to me. As nothing is known of such a publication by Freud, it is not clear where Breuer's daughter could have read it. In the version by Ernest Jones, after his flight Breuer quickly goes on a second honeymoon to Vienna with his wife Mathilda, who actually conceives a child there—in contrast to the imaginary child of Bertha Pappenheim. There is no evidence for any of this, and most of it has been proved false. Breuer did not flee but rather referred his patient to Kreuzlingen. He did not go to Vienna but with his family on a summer vacation to Gmunden, and he did not conceive a child (either in Vienna or in Gmunden), since his youngest child—Dora Breuer—was born on 11 March 1882, three months before the alleged conception. Freud's purpose in describing the conclusion of treatment in a way that contradicts some of the verifiable facts is unclear. The assumption that he wanted to make himself the sole discoverer of psychoanalysis at Breuer's expense is contradicted by the description of the discovery in Freud's writings, in which he does not minimize Breuer's role, but rather emphasizes it. Freud's behavior is compared by some authors with his conduct in the so-called "cocaine affair". There, too, he gave false representations not only privately, but also several times in published form, without there being any advantage to offset the risk of lasting damage to his scientific reputation. Breuer later described the therapy as "a trial by ordeal", probably in the sense of an examination. It claimed of him over 1,000 hours in the course of two years. So the famous first case he treated together with Breuer and which was vastly praised as an outstanding therapeutic success was nothing of the sort. But in this famous case the patient was not healed. Freud told Jung that all her old symptoms returned after he had given up the case. Opponents of psychoanalysis use this statement as an argument against this therapeutic approach. How Pappenheim herself assessed the success of her treatment is not documented. She never spoke about this episode of her life and vehemently opposed any attempts at psychoanalytic treatment of people in her care. Aspects of Bertha Pappenheim's biography (especially her role as Breuer's patient) were treated in the film Freud: The Secret Passion by John Huston (along with elements of other early psychoanalytic case histories). The film is based on a screenplay by Jean-Paul Sartre who, however, distanced himself from the film version. Josef Breuer's treatment of Anna O. is portrayed in When Nietzsche Wept. Since Anna O. 's treatment in the 1800s, current research has suggested many illnesses she might have suffered from. Many believe that the illness was not psychological as Freud suggested but either neurological or organic. Medical researcher Elizabeth Thornton, after interviewing many of Freud's early patients, suggested that Anna O. had suffered from tuberculous meningitis. Others have suggested it was encephalitis, a form of brain inflammation. Many have also suggested that she suffered from a form of temporal lobe epilepsy since many of her symptoms, including imagined smells, are common symptoms of types of epilepsy. Aubin, Melissa. "Bertha Pappenheim", University of Toronto. ^ Sigmund Freud: Five Lectures on Psychoanalysis. ^ In: Vorlesung zur Einführung in die Psychoanalyse. Studienausgabe vol. 1. Fischer 1969–75. p. 279. ^ See: Sigmund Freud: Brautbriefe: Briefe an Martha Bernays aus den Jahren 1882–1886. Ed. Ernst L. Freud. Fischer, Frankfurt a. M. 1987. ISBN 3-596-26733-1. Other quotes are scattered throughout various publications on the life of Freud, especially in the biography by Ernest Jones. ^ Stefan Zweig: Briefwechsel mit Hermann Bahr, Sigmund Freud, Rainer Maria Rilke und Arthur Schnitzler. Ed. Jeffrey B. Berlin, Hans-Ulrich Lindken and Donald A. Prater. Fischer, Frankfurt a. M. 1987. p. 199–200. ^ Jensen: Streifzüge. p. 35. ^ Carl Gustav Jung: Analytische Psychologie. Nach Aufzeichnungen eines Seminars 1925. Ed. William Mc Guire. Walther, Solothurn-Düsseldorf 1995. p. 41. ^ Charles Aldrich: The Primitive Mind and Modern Civilization. London 1931. p. 213. ^ It is assumed that Pappenheim destroyed all relevant documentation during her last stay in Vienna in 1935. See Edinger: Pappenheim 1968. p. 20. ^ Edinger: Pappenheim 1968. p. 15. ^ O Anna: being Bertha Pappenheim, Robert Kaplan.